Pictured are 4K through 5th grade students of the month at the School District of Niagara for March. Pictured are 4K through 5th grade students of the month at the School District of Niagara for February. Pictured are 4K through 5th grade students of the month at the School District of Niagara for January. Pictured are 4K through 5th grade students of the month at the School District of Niagara for December. Front row from left: Alexandra Kreh (4K), Liam Miller (1st), Brenden Fitzpatrick (K). 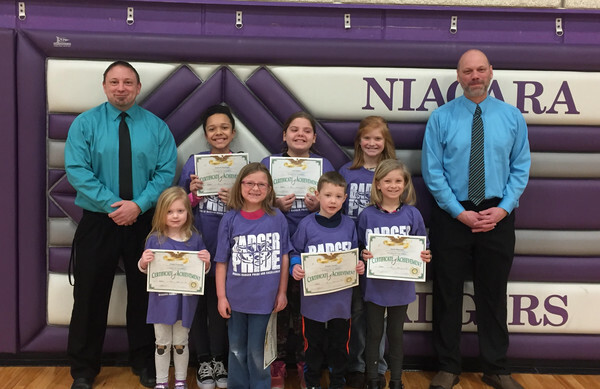 Back row from left: Mr. Trevillian, Principal, Brooke Newingham (4th), Ingrid Holt (5th), Taylor Martin (3rd), Jaelyn Kleikamp (2nd), & Mr. Hanson, Director of Pupil Services. Front row from left: Nicole Kreh (1st), Elijah Laarman (4K), Ricky Reynolds (K). Back row from Left: Mr. Trevillian Principal, Zane Phillips (3rd), Abain Patterson (4th), Jesse Wahlstrom (2nd), Christian Anderson (5th), & Mr. Hanson, Director of Pupil Services. Pictured are 4K through 5th grade students of the month at the School District of Niagara for October. Front Row from left: Emma Wahlstrom (K), Cooper DeClark (4K), Joshua Mills (2nd), Boston Werner (1st). Back row from Left: Mr. Trevillian Principal, Kristina Kreh (3rd), Jayden Bryngelson (4th), Brooke Bruemmer (5th) & Mr. Hanson, Director of Pupil Services. Pictured are 4K through 5th grade students of the month at the School District of Niagara for September. Front Row from Left : Harley Thompson (4K), Avery Ochs (K) , Natalia Freeman (1st). Back Row from Left: Mr. Trevillian, Principal, Mason Emery (3rd), Alaina Cadiente (2nd), Elesia Sweig (5th), Grace Payette (4th), and Mr. Hanson, Pupil Services Director.